Ms. Malhotra has been teaching in early education settings for the last five years and is excited to be the Lead Montessori Guide in the Yellow Room. 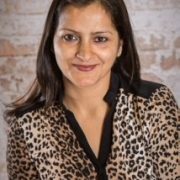 Ms. Malhotra was born and raised in Chandigarh, India and came to Atlanta in 2007 after spending a few years in London. She has received her M.A. in English Education and is finishing her Montessori training from PAMS (Pan American Montessori Society). She is married and has 2 loving daughters ages 12 and 8. She loves children and feels blessed and fortunate to spend time with them in the beautiful environment of Montessori. She enjoys cooking, listening to music, nature walks and spending time with her family.